Posted on March 3, 2015 by Joshua Prince, Esq. 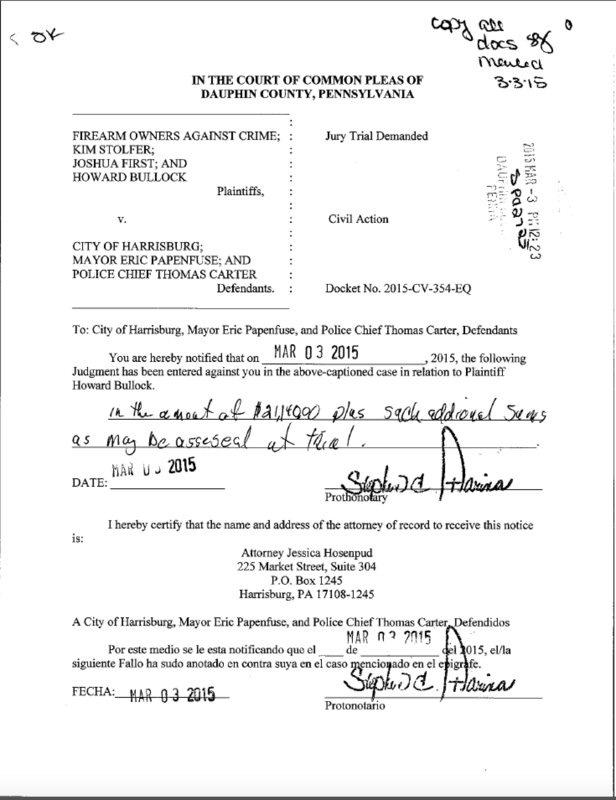 Today, the Dauphin County Prothonotary entered a default judgment for Plaintiff Howard Bullock against the City of Harrisburg, Mayor Eric Papenfuse and Police Chief Thomas Carter in the amount of “$21,140 plus such additional sums as may be assessed at trial.” You can download an entire copy of the Default Judgment here. This default judgment stems from a lawsuit filed against the City of Harrisburg, Mayor Eric Papenfuse and Police Chief Thomas Carter by Firearm Owners Against Crime (FOAC), Kim Stolfer, Joshua First and Howard Bullock, as a result of their illegal firearm ordinances. On February 13, 2015, the Defendants removed FOAC, Kim Stolfer and Joshua First to the United States District Court, Middle District of Pennsylvania; however, they left Howard Bullock’s claims pending before the Dauphin County Court of Common Pleas. As the Defendants failed to file a responsive pleading to Plaintiff Bullock’s claims, even after being provided the requisite 10 day notice, the Dauphin County Prothonotary entered a default judgment for Mr. Bullock against the Defendants. Next Post Did Attorney General Kane Mislead the General Assembly and Fail in Her Statutory Duty? Good news – and thanks for the update Josh! May this be the first of many victories – perhaps they will get more adequate legal counsel on the next try? To add insult to injury, Harrisburg’s attorney is going to bill Harrisburg for not doing his due diligence. Round one goes to gun owners. Let Philly., Lancaster and Pittsburgh get the message. The Judges will rule correctly. PA laws must be obeyed. IANAL, but this doesn’t really prove anything about the case, other than that the city’s lawyer was incompetent and/or lazy. OTOH, it’s nice to see our side win something, even if it’s just one-zip because the other team didn’t show up.